After making cupcakes stuffed with peanut butter balls this weekend, I had to come up with a nut free version for my nut allergy kiddo, who was feeling all kinds of left out of the stuffed cupcake enjoyment. Since we love making cupcake pops with the Oreo Truffle recipe, I figured I would try that. 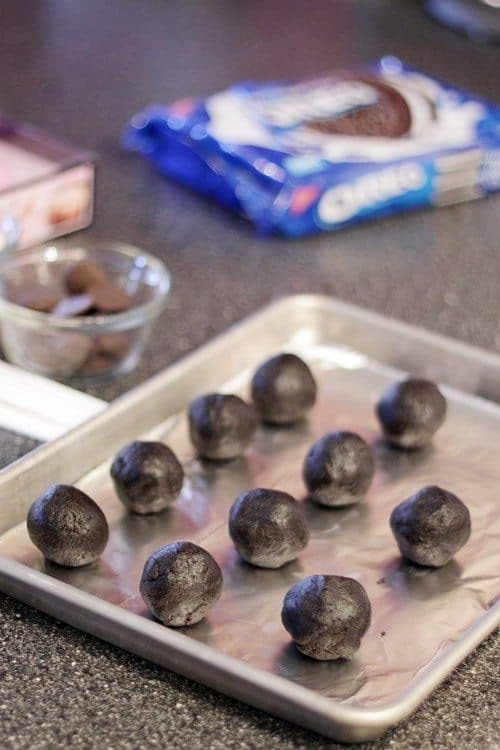 To make these, you will first want to make your Oreo Truffles. 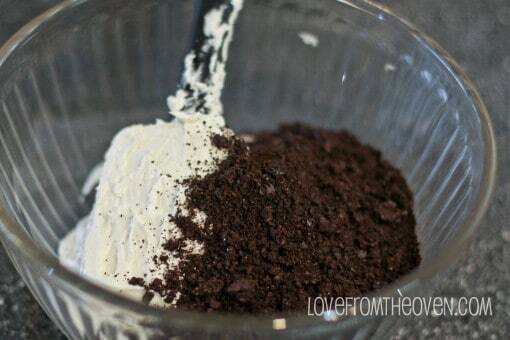 Follow the directions from this post – it’s super easy – basically just cream cheese and crushed Oreos (you can use a food processor or just put your Oreos in a big Ziploc and go at them with a rolling pin). For 24 cupcakes, I’d use an entire regular size bag of Oreos and about 3/4 to a whole 8oz block of regular cream cheese, and you should be able to get 24 one inch size truffles. Once you have them shaped into balls, put them in the freezer. You won’t be needing to shape them into cupcakes or dip them into chocolate, so at this point they are good to go, just freeze those babies. I would say make sure to leave them in the freezer at least 20 minutes – the freezing will help them hold their shape while you bake your cupcakes. 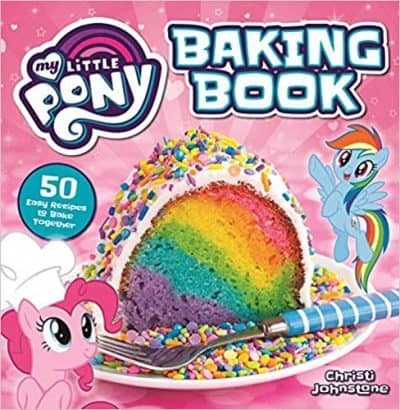 Next make up your cake. You could really use any kind you like. 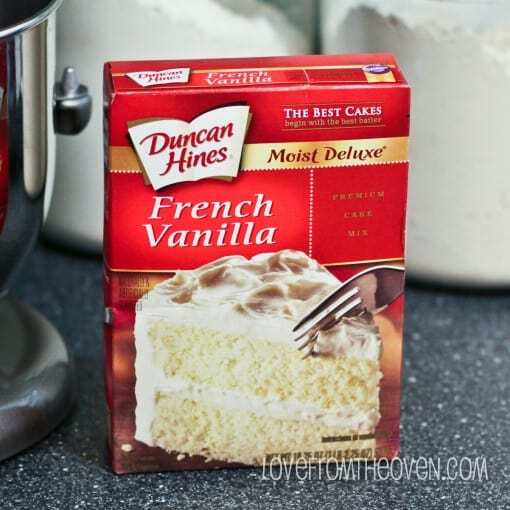 I used a Duncan Hines French Vanilla (one of my favorite vanilla cake mixes). Prepare according to the package directions. When you are ready to fill your cupcake liners, put a bit of the batter in each cupcake liner – enough to cover the bottom. 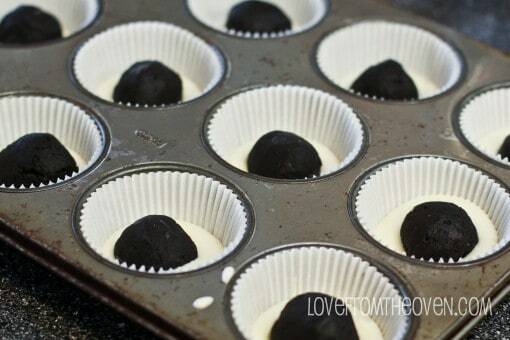 Then add in your Oreo truffle balls. And cover with your remaining batter. Bake according to the package directions. After they have cooled you can get ready to frost. I used a basic buttercream recipe and added crushed Oreos to the frosting. But surprise! Oreo truffle hiding inside. Yummmmmy. I’m totally loving this stuffed cupcake thing. Brainstorming all sorts of fun versions! 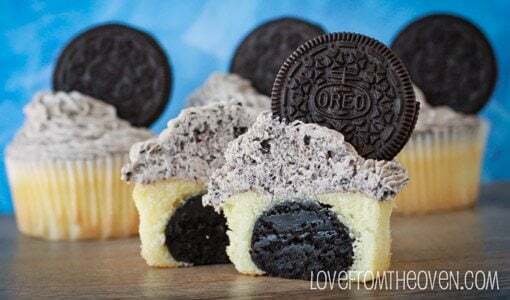 If you love the Cookies & Cream combo, make sure to check out the Cookies & Cream Bites From Other Blogs for lots of great recipe ideas! I have a serious Oreo addiction. I’d want all of these just for myself! They look awesome! Oh my god that ball of oreo in the middle looks amazing! What a great idea & use of the oreo! And the icing looks fantastic! Yum! 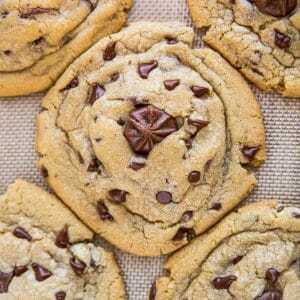 I wish I were stuffing my face with these RIGHT now! Hey, I once made red velvet cupcakes with pie-filling cherries. Follow instructions for red velvet cake mix, and pour just like you did with these, only add 2-3 cherries into it… then you frost with homemade cream cheese frosting. When I made it, the frosting was a bit runny, but then hardened. Before it hardens, but 2-3 more cherries on top. 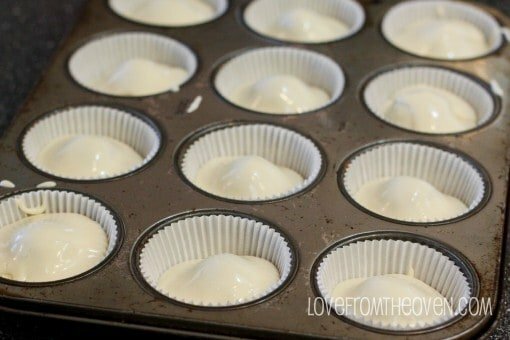 Bake them in the foil cupcake cups to hold it all together better. It’s absolutely delicious, and you may need a fork! Holy yum, oreo truffles are too delicious. Girl, you are crazy awesome. this is so getting pinned! 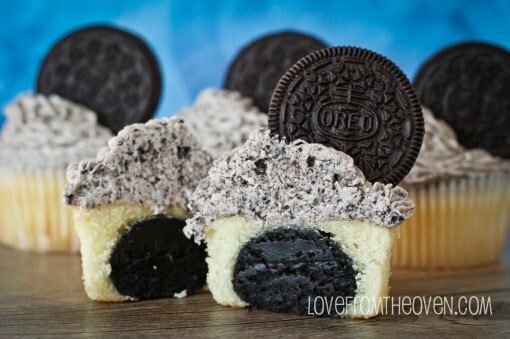 Stuffed cupcakes are the best and oreo truffles are one of my favourites. 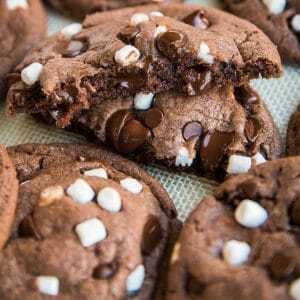 Definitely going to be making these! Wow! They look amazing! And yummy! Another great cupcake recipe. I wish I were filling my experience with these RIGHT now! Wow, these are so interesting. It is just one cookie, but it has so many things inside. It is like opening a present. 🙂 So cute. I have a question about the Oreo ball on the inside.. I’m not a huge cream cheese fan, can you taste the cream cheese or is there something that I could substitute it for? I don’t think you taste the cream cheese, but you could probably use frosting in it’s place, or even half cream cheese half frosting. Woah. You just blew my mind with these. So simple but SO amazingly delicious. I can’t wait to try – thanks for another lovely recipe!! 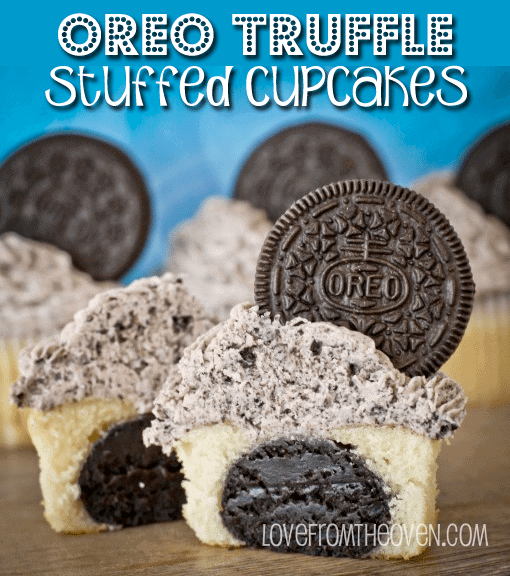 I love stuffing truffles into my cupcakes, but haven’t tried this yet. Sounds awesome. WOW!! 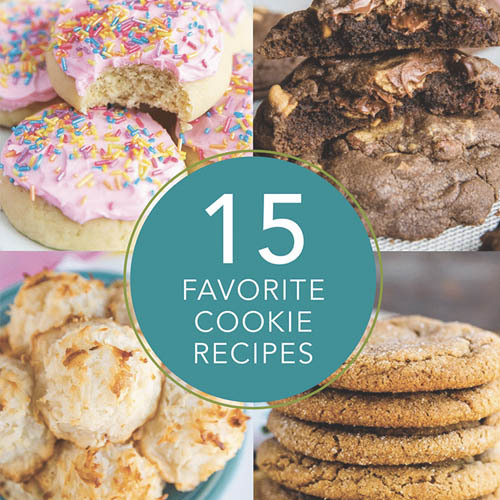 These look like a giant batch of awesomeness!! I love these cupcakes. Oreos are the best:) Thanks for the great post. Congrats on making Foodbuzz top 9. I totally understand why they were voted- they’re absolutely stunning! Love your site. Can’t wait to see what you bake up next. I totally made these last (Friday) night. They were so much fun to make and taste simply delicious. The people I’ve shared them with so far adore them. Thank you for sharing! I made these monday. They were absolutely fantastic. Thank you for the recipe!! 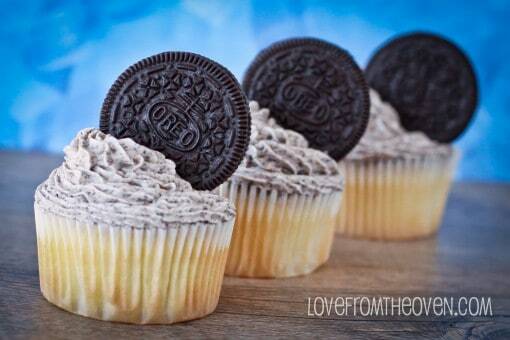 I love these Oreo cupcakes! The cream cheese frosting goes great with them. It’s a lot like the filling I used on an Oreo cream cheese cake I made for a birthday. i love oreos. you are killing me! 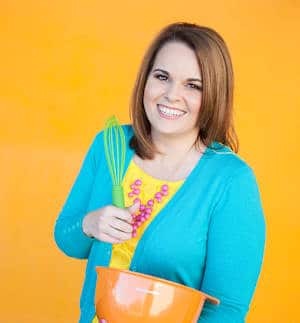 I soooooo love all the recipes with Oreos, but I’ve got a question. Here in The Netherlands they sell different sized packages of Oreos.. And we can’t really figure out what the regular size bag is in the USA. Can you tell me what the weight is..? Roos, the standard size bag of Oreos is 18oz. Hope that helps! These cupcakes were amazing!!!! Thank you for posting this recipe. Once they are done baking do they need to be put into the fridge since the truffles have cream cheese in them or will they be ok sitting out for a few hours before serving?? I just made these cupcakes last night. They are AMAZING. 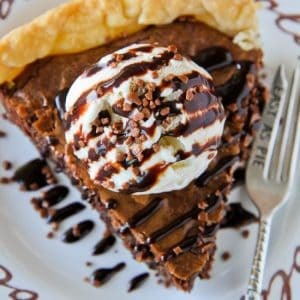 Very sweet, perfect for people like me and my family who could live off of sweet treats! Thanks for the recipe! could i make the buttercream without a paddle attachment i just have the regular mixer attachment ??? Since the Oreo truffles are made with cream cheese, should these cupcakes be refrigerated? Also I love your header, the colors, font, and the pictures, especially the one of you and your daughters! Take care! 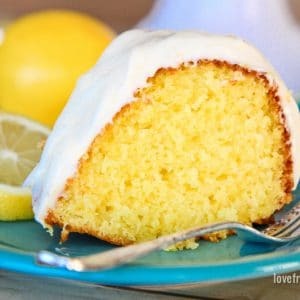 could make in advance and freeze them (minus the icing on top)? Has anyone tried this? Brilliant idea. 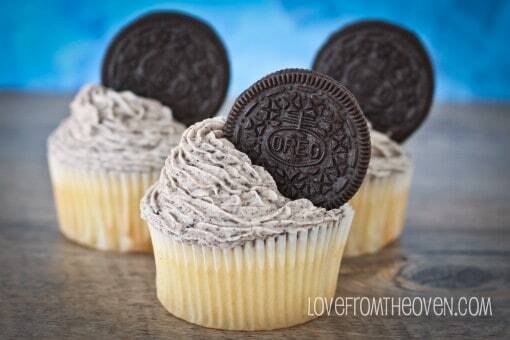 I have a,great chocolate cake oreo cupcakes but this is,awesome. I’m definitly tying this. These cupcakes are amazing!!!! This time I made them with the buttercream frosting (which is delicious) but it can out very thin and wouldn’t hold the cookie up! 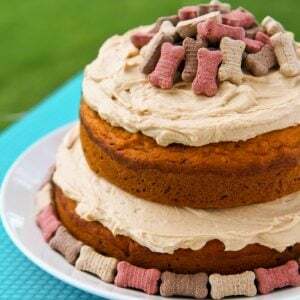 Do you know how I can get my buttercream frosting to be thicker? I mad this for my daughter’s bday! Everyone loved them! Thanks for sharing! ok so…the frosting was AMAZING but my cake balls cooked??? I froze them overnight and they still cooked? It was like a dry ball in the center. What did I do wrong? Were yours moist on the inside? Rita, yes, mine were still like truffles on the inside. You said cake balls, where they the Oreo Truffles (cream cheese and Oreos?). The only thing I could think of is that you needed more cream cheese in them. They should be pretty moist, to the point of sticky, when you make them. They are a consistency that has me washing my hands every few balls, because they are pretty darn messy. PBnJFam – my first thought is that the truffles themselves may have been too dry. I would probably up the cream cheese (I’ve also found some cream cheeses seem to have a higher moisture content – I think even the freshness of the cream cheese can make a difference) and sometimes you have to adjust to get the right consistency versus using “x” amount. You’d probably want them pretty sticky/moist. Hope that helps! Silly question. I’m trying to figure out how many oreos I need….is it one whole package for the oreo truffles? If yes, how many do I need to mix in with the icing? Thank you! is the oreo ball creamy or what? Thank you so much for this recipe.. I made the cupcakes last week and they were a hit with everyone.. 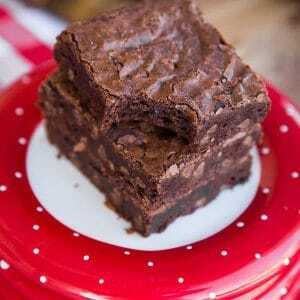 This recipe is now in my binder! 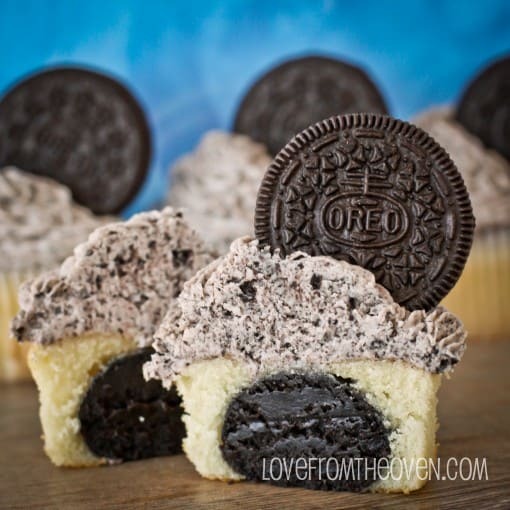 Thank you for sharing your recipe Oreo truffle cupcake .I will give it a try this weekend. Can you bake the cupcakes then add the truffle after baking and cooled? That’s how I do my cookie dough stuffed cupcakes. I haven’t tried it but you certainly could give it a go!